Quite when the TV-Link slipped onto the shelves, and in what quantity it did so, remains something of an undocumented mystery, although given that the Supervision debuted in 1992 and didn’t have that much of a lifespan, it may well have predated Nintendo’s similar Super Game Boy (1994). There are no tell-tale dates on either the box or within the documentation that came with our unit but let’s begin by taking a look at that. The system comes packaged in a typically cheap cardboard box (no inner tray) featuring the image of a fully brand-bedecked child, seemingly floating in space (in actuality laying on the floor) and playing his unit via a docked Supervision. Curiously, the game he is playing is Crystball, only in what appears to be full colour (well, some colours.) The image is interesting for its use of red and brown shades, something not present in the system’s actual use of colour, but we’ll come back to that. Supervision T-shirt and small boy sold separately. Batteries "excluded". The latter is probably a good thing given what time might have otherwise done to them, if left unattended. inside the box are a whole bevvy of leaflets (many of which are duplicated) and include instructions (in English, French, Dutch and Italian) for hooking up the system, more leaflets are included for using the Supervision itself and there is also a guarantee form that can be mailed off to ‘Watary Italia’. Why the name was altered for the Italian market is unknown to us. Perhaps someone can comment below if they know the reason. In the meantime if anyone would like some high quality scans of these leaflets and manuals then please comment below and we will upload some. ​Inside the box you’ll find the main TV link docking unit itself, av cables, an aerial box that switches between TV and Game for RF output and a standard RF lead. 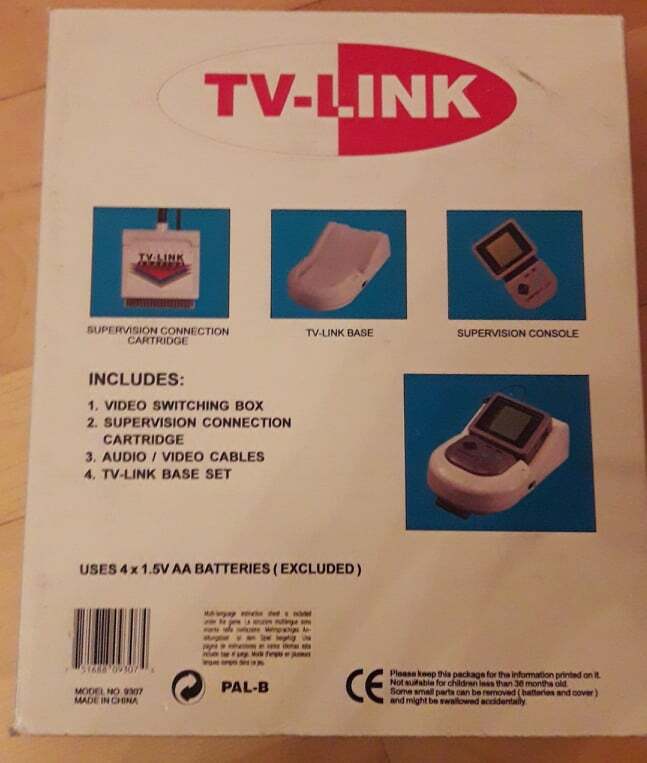 Aside from this, there’s a unique Supervision cartridge, labeled ‘TV-Link Adaptor’ with wires coming out of it connecting to both the docking station and the TV-Link’s DC 9v output (presumably to draw power from the handheld which has the actual AC input connector). The switch box for TV/Game RF input was particularly grubby and seemed to be some cheaply sourced third party thing, as the picture of the console displayed on it looks more like an Atari than a Watara product. The word, ‘docking station’ is perhaps a little disingenuous. As with the Super Game Boy, the TV Link contains an actual system on its own, all the cartridge actually does (aside from displaying a neat little graphic of a futuristic robot) is connect the supervision as a potential power source via it’s own mains adaptor and for its primary role as a battery guzzling controller. Interestingly, a 'comm port' on the side exists, which the manual describes as being for “Two Player Link”. Perhaps this was wishful thinking, given that no such link cable was, to our knowledge, ever released for the system, despite the same comm port being found on the handhelds themselves. The port will be familiar to gamers back in the day as it was the same one used as a joystick port for the C64 and Sega Mega Drive among others. Speaking of batteries, you will need to either source a reliable AC adapter or drain your way through plenty in true early 90’s fashion. The Supervision itself takes four AA batteries, but the TV link also consumes another four. The instructions warn against using rechargeable batteries (or mercury oxide batteries, whatever those are) but give no indication as to why. If the batteries you use aren’t new then you are likely to face frustration, as we initially did, in getting the system working. While it might power up, using batteries that are sufficiently drained of their zest will result in the TV-Link’s low power LED lighting up and games failing to load. Battery life is not good at all and you can expect to get little more than a few hours of gameplay out of the TV-Link using this method. An AC adaptor is recommended. On a neat side note, the battery compartment is the exact size and shape of that of the original Supervision including those pesky non-Game Boy friendly hinges. Okay, that's the system itself, but what can it actually do? Let's plug it in and find out by clicking the link below!